Since the beginning of the Syrian crisis in late 2010, I have been writing repeatedly that there are no “moderate rebels” in Syria. Many other credible researchers and even mainstream news organizations, albeit significantly after the fact, havemade similar statements in their own writings. In fact, I have even gone so far as to suggest that, if such a thing as a moderate rebel in Syria actually exists, then he must be brought forward for analysis. The process by which one becomes a “moderate rebel” vs. a radical jihadist is not by the common sense messages of radical clerics or by taking a firm stand against a totalitarian government. Nor does one become a moderate rebel by joining al-Qaeda, committing atrocities, and imposing Sharia Law. One becomes a moderate rebel by joining al-Qaeda, committing atrocities, imposing Sharia Law and subsequently stating that you do not belong to al-Qaeda. At that point, you are fit to receive all the funding available from the coffers of the GCC and NATO. Of course, the logic above is incredibly ridiculous. Yet it is, in fact, this very logic that the State Department, NATO, and its puppet governments in the Gulf expect the American people and the people of the Western world to believe. This is because Qatar is now attempting to rebrand Jobhat al-Nusra as a “moderate rebel” brigade operating inside Syria and thus openly provide the al-Qaeda branch with relatively sophisticated weaponry and training. That is, even more so than is already being provided and in a much more blatant fashion. The requirement for receiving such weaponry openly? That Nusra “disavow” its connections with al-Qaeda. Of course, the suggestion that al-Nusra is actually a separate organization to begin with is an absolute falsehood. After all, Al-Nusra Front is merely the Syrian branch of al-Qaeda in the same way in which al-Qaeda in Iraq functioned as the Iraqi branch of al-Qaeda in that country. Even the CFR’s Foreign Policy was forced to admit that al-Nusra is simply Al-Qaeda in Syria. An Al Nusra removed from Al Qaeda on paper wouldn’t mean an anti-Al Qaeda Al Nusra at heart. The history of attempts to turn extremist groups into non-extremist, well-behaved proxies is riddled with failures and devastating blowbacks. Al Nusra was formed to spread bin Ladinism into Syria, and its members are true adherents of that ideology. 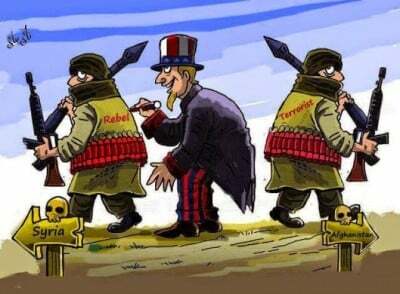 The truth, of course, is that the GCC (which includes Qatar) as well as the United States and NATO have been supporting al-Nusra all along so there was never any need for al-Nusra to “break away” from al-Qaeda to reap the benefits of Western aid, which it refused to do. After all, al-Qaeda in Iraq and al-Qaeda proper have also been receiving Western funding from the very beginning of the Syrian crisis. Al-Qaeda was created by the US and NATO as far back as the late 1970s. Al-Qaeda’s Syrian affiliate Al-Nusra Front on Monday reaffirmed its allegiance to the global extremist network and denied any plan to break away and become a more internationally acceptable rebel force. The angry statement followed weeks of speculation on Internet social networks of a split between the jihadist allies. Al-Nusra “completely denies reports of a break-up with Al-Qaeda,” the group said in a statement released on Twitter. It said Al-Nusra “remains the backbone of jihadists” in Syria, “the first into battle, dedicated to unifying the ranks around sharia (Islamic law)… righting injustice and defending the disadvantaged”. Indeed, the idea that a mere verbal denunciation or formal declaration of opposition will change the fact that Nusra and Qaeda are the same organization is fundamentally irrational. For those who may have been easily confused in regards to events taking place in Syria by the frequent name changes and allegedly shifting alliances, it is important to remember that, not only are there no moderate rebels operating inside the country, but those jihadist forces that are operating in Syria are nothing more than small branches of the same organization which is, itself, a creation of the United States and NATO.